It is so funny how some memories will stick with you throughout your life. My mom, much like me, would buy food that she did not know just to find out what it tasted like. She not only introduced us to many food that we would have not normally been exposed to, but she also taught us that it is important to try things once. You just never know if you are going to like it. She would buy fruits from Asia, the tropical islands… wherever it came from. I will always remember when she bought some lychees, or dragon fruits. We were disgusted just to look at those strange looking fruits, but they tasted so good that their appearance did not matter at the end. It was the same with coconut. One day she came home with a coconut. It took us a while to try to open it. At the end i think that my dad hit the shell with a hammer so hard that the coconut broke in tens of pieces. The flesh stayed on the shell which made it very difficult to remove it and use it. I think that my mom did not really make anything with it. She just gave us some of the coconut shell “flesh” and we try to eat the flesh of it as best as we could. 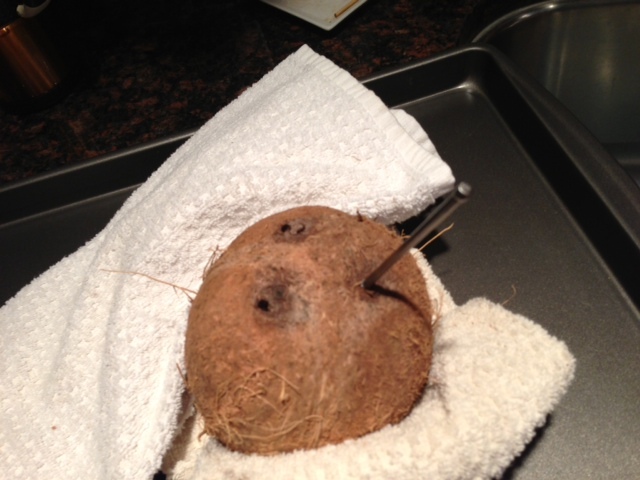 1. place the coconut on a towel and hammer clean nails in the soft spots of the coconut. Turn the coconut upside down with the holes facing down and shake the coconut so that the “coconut water” will drain out. 2. 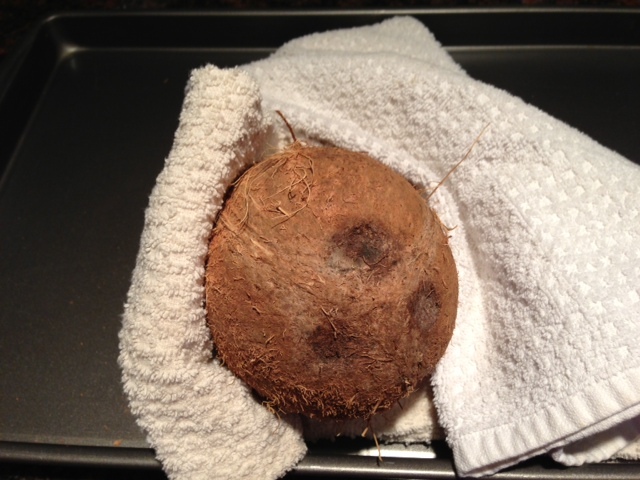 Then wrap the coconut with the same towel and with a hammer, hit the coconut so as to make a crack in the shell. 3. 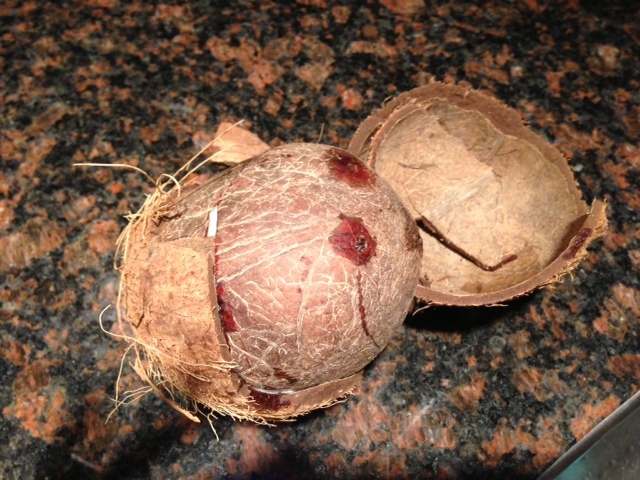 With your fingers, pry the coconut open and the coconut fruit/ meat should detach from the shell. 4. rinse the coconut meat. And with a potato peeler, peel the brown skin. What to do with fresh coconut?? You can eat it raw– it is quite good.. though a bit different than what you may be accustomed to if you have only eaten it baked or toasted. You can either shave it, or grate it and include it in you breakfast or salads. You can toast the coconut and use that way in many recipes. shred or slice the coconut thinly and bake it in the oven at 300 for 10 minutes stirring every 5 minutes to make sure that the coconut browns evenly. You can also toast coconut on the stove top. 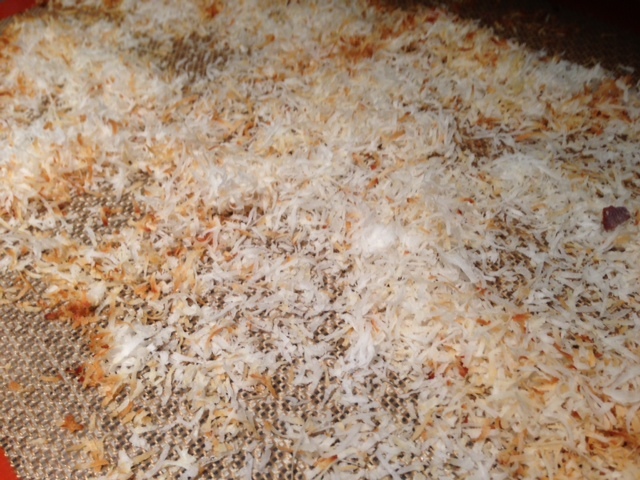 Spread shredded coconut into a large skillet and cook over medium heat, stirring frequently, until coconut is mostly golden brown. 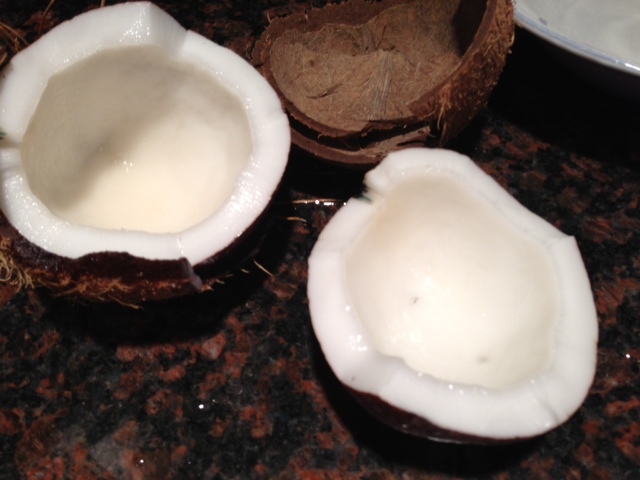 Coconut will probably brown a bit less evenly in a skillet than in the oven. grate the meat and immerse the meat in some fresh water, adding 2 cups of water for the meat of one whole coconut. An easier and faster way to make coconut milk is to place the coconut flesh and coconut water in a blender, adding two cups hot water. Blend until the coconut and water forms a smooth slurry. Pour coconut mixture through a fine sieve or a milk bag and then into a mason jar or a pitcher. 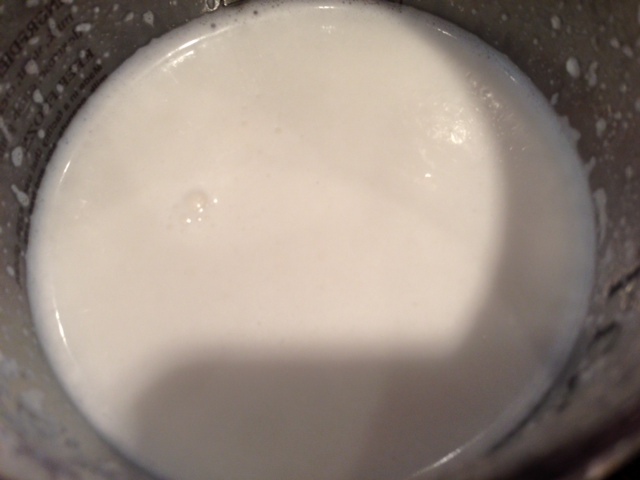 Squeeze out as much liquid as possible, and transfer the coconut milk to the refrigerator. C’est tout!!! So what are the incentives in making the toasted coconut and the coconut milk by yourself? In Nourished Kitchen, the author of the blog points out the many health benefits of having fresh coconut versus canned milk. He points out that “Fresh, homemade coconut milk is also richer in vitamins, food enzymes and nutrients than coconut milk from a tin. Indeed, fresh coconut milk contains three times as much vitamin C as canned coconut milk and is richer in thiamin, niacin, vitamin B6, folate and panthothenic acid. Moreover, fresh raw coconut milk contains vitamin E, a heat-sensitive, fat-soluble vitamin that is otherwise absent in canned coconut milk”. So now that I have shown you what to do with fresh coconut, I hope that you will give it a try, and make fabulous recipes. 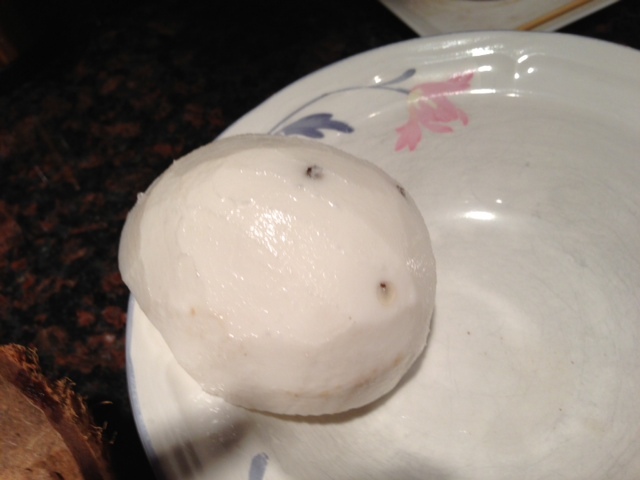 We used ours to make coconut ice cream and coconut macaroons;-) Yum!!! !